If you’re already starting to get the sniffles and sneezes, then you’re not alone. Along with the warmer, sunnier weather comes the dreaded hay fever season. Unfortunately, if you’re a sufferer, that glorious sunshine can also herald the onslaught of streaming, puffy eyes, tight throats and stuffy noses. The problem is, many over-the-counter hay fever meds come with their downsides, including drowsiness. If you're tired of feeling…well…tired during the hay fever season, then don't worry. Help is at hand! Here are our top tips on dealing with pollen allergies, naturally. 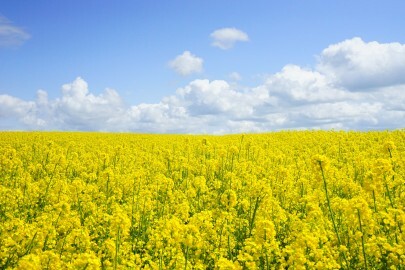 Hay fever is simply your immune system over-reacting to pollen, so vitamin D is an amazing weapon to arm yourself with. The Sunshine Vitamin can help to prevent your immune system from over-reacting, so try to get in as much sunshine (not easy in the UK, we know!) as you can or take a good quality supplement. While vitamin D isn’t found in huge amounts in foods, you can still top it up by eating lots of oily fish and organic eggs. Vitamin C, found in wonderful fresh produce such as red pepper, broccoli, kiwis and oranges, is a natural anti-histamine and can work wonders for allergy sufferers. Better still, oranges, lemons and grapefruits contain bioflavonoids, which can work as a natural decongestant. Perfect for stuffy, over-worked noses! Buy yourself vats of raw, local honey at the start of the hay fever season. It’s thought that enjoying a spoonful of this delicious treat each day can de-sensitise your body to pollen. However, it takes a couple of months to build your resistance up, so get eating now! Try to avoid eating foods that can cause allergies or upset your immune system. That means stepping away from gluten (hurrah – more reason to eat Rizopia! ), lactose, and artificial ingredients. If you’ve ever eaten spicy food and find your nose streaming, this is why! Red peppers and hot, red chilies contain plenty of capsaicin. This works to open nasal passages and helps to reduce congestion – ideal if you’re feeling bunged up.